We see so many stories proclaiming the final nail in the coffin of so many species around the world (and indeed, species extinction is a serious issue) but today there is actually some good news about the Arabian oryx, which was previously considered extinct in the wild. Good news needs to be talked about more, so inspired by this post from New Scientist I wanted to share the Arabian oryx's story. 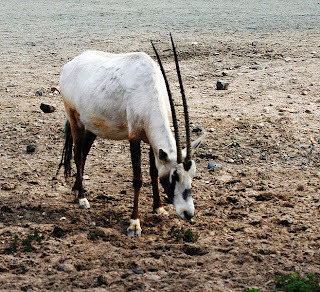 Around 1972 the last wild Arabian oryx (Oryx leucoryx) was killed, most likely in Oman. While the species was extinct in the wild there were still several in captivity, particularly at the Phoenix Zoo, which received four wild Arabian oryx in 1963 as a part of a conservation effort called Operation Oryx. After the species went extinct in the wild, individuals from the zoo’s breeding program were brought together with individuals from royal collections in Abu Dhabi, Qatar, and Saudi Arabia to make a last “world herd.” A breeding program began and in the early 1980’s the first individuals were reintroduced into the wild in Saudi Arabia, Israel, the United Arab Emirates and Jordan. The Arabian oryx has since flourished, reaching a wild population of more than 1000 individuals, and is continuing to increase. This had led to the Arabian oryx officially being moved from endangered to vulnerable on the IUCN Red List. 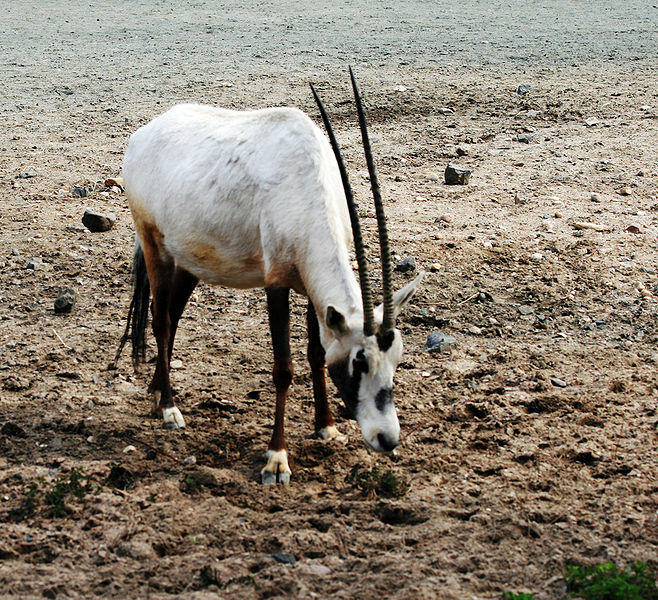 A 2008 assessment showed that the Arabian oryx had recovered enough to no longer qualify as even an endangered species. The IUCN Species Program produces, maintains and manages the IUCN Red List, and implements worldwide species conversation projects. The Species Program is headquartered in Switzerland and is designed to determine the relative risk of a species facing extinction. The Red List is used to keep track of and bring attention to the plants and animals that directly risk global extinction. Under IUCN Red List Guidelines a species can only move to a lower category if none of the criteria for the higher category have been met for five years or more. To be considered endangered there must be 250 or fewer mature individuals of a species, so the Arabian oryx, which is doing well at over 1000, will be listed as Vulnerable starting this year. The Arabian oryx is native to the Arabian Peninsula, and doesn’t have many natural predators; humans drove the animals to extinction from hunting. In addition to the 1000 in the wild there are another 6,000-7,000 individuals alive in captivity around the world, many within the Arabian region. Interestingly, the population that was re-introduced to Oman (where the last wild Arabian oryx were killed before it went extinct in the wild) has been struggling. The Oman population was hurt through illegal live capture for private sale, and has been rendered ineffective because only males remain. Most new populations are in secure areas that are relatively safe from poaching, but animals that wander outside protected sites have no guarantee of safety. Future release locations for animals bred through captivity will be determined by the potential effects of drought and overgrazing, which have reduced available areas where populations could thrive. Now that I'm spending my days perusing the internet (so much more than ever before!) I've seen a lot of strange, strange, and I mean STRANGE things. In addition there is also so much negative news from hackers to politicians to criminal cases and everything in between that I feel like little glimmers of good news, particularly about successful conservation efforts should to be recognized. It doesn't make the bad news easier to swallow, but it still makes things seem brighter. While searching for it online, soup.io/ you will get it by the name of Music Paradise Pro. Here It is the most up to date version of Music Paradise Pro PC, Android, iOS Free Download (APK) the Music Paradise App and also improved also.Music Paradise Pro Yet prior to entering into the detail of its attributes, Music Paradise Pro Download it is necessary for you to comprehend. it making use of Mobdro app. Mobdro App You don't need to register with this application for official source streaming on the internet video material. Merely download the Mobdro apk file and also mount it on your tool. After that, Mobdro for Android follow the actions as per their direction.